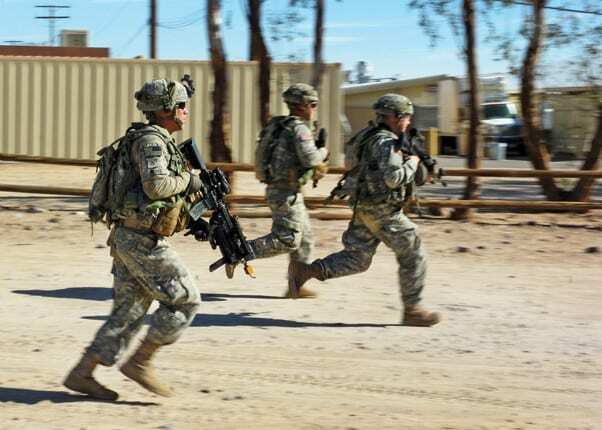 Soldiers of 1st Armored Brigade Combat Team, 1st Cavalry Division from Fort Hood, Texas, run to pull security during an exercise simulating an attack on an entry point here, Oct. 8. The United States Army’s 1st Armored Brigade Combat Team, 1st Cavalry Division, concluded a decisive action rotation here in October. The Ironhorse brigade spent two weeks (Oct. 10-23) – of the four week rotation 16-01 – in “the box” or the 1,200 square miles of maneuver area of the National Training Center. The field portion challenged the 1ABCT/1CAV DIV in scenarios within a contemporary operating environment force. The COEFOR included a near-peer conventional force, host nation security forces, guerilla forces, insurgent forces, and a criminal element to replicate the complexities of the modern battlefield; combined together these elements of the NTC provided a tough, realistic training environment and first class leader development opportunity (NTC regulation 350-1). The brigade also conducted live-fire training – from small arms weapons to M1 Abrams tanks and artillery. Shortly before training started, the 1ABCT/1CAV DIV commander – Col. John Digiambattista – stated that his brigade is one of only nine armored brigade combat teams in the Army and has unmatched firepower and lethality. 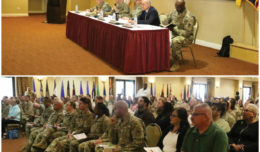 “Upon completion of this decisive action NTC rotation, the Ironhorse brigade will be fully trained and ready for our nation’s call to any mission,” said Digiambattista, a native of Anaheim, Calif., and 1991 U.S. Military Academy graduate. 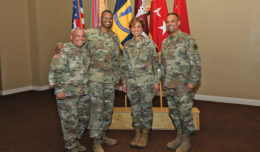 Digiambattista commended his Soldiers for their hard work and dedication leading up to the NTC training. Captain Tony Nguyen, commander of A Co., 2nd Battalion, 8th Cavalry Regiment (2-8 CAV) with Ironhorse, said he expected his infantry Soldiers – operating primarily M2 Bradley fighting vehicles – to have an open mind and a willingness to learn. However, he also anticipated his Soldiers taking initiative and practicing the skills and crafts they have honed. “This shouldn’t come as a surprise to them. I tell them this all the time: ‘You know what the right answer is. Go out there and do the right thing. Execute what you’ve been taught’,” said Nguyen, who is an infantry officer from Baton Rouge, La., and oversees approximately 100 Soldiers and 25 vehicles. The brigade public affairs officer, Capt. Pete Bogart, said Ironhorse prepared at Fort Hood for the rotation, from the individual level, to squad and platoon levels. Preparation culminated in August with a combined live-fire exercise, including combined engineers, combined arms battalions, and attack aviation. The NTC training allowed the brigade to confirm its capabilities. 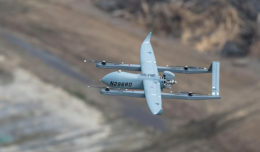 “[The rotation] brings the whole brigade together and gives us a chance to validate our whole brigade – all our systems, our logistical processes and everything that goes into moving this big of an element across the country – and then train together as an entire brigade,” Bogart said. 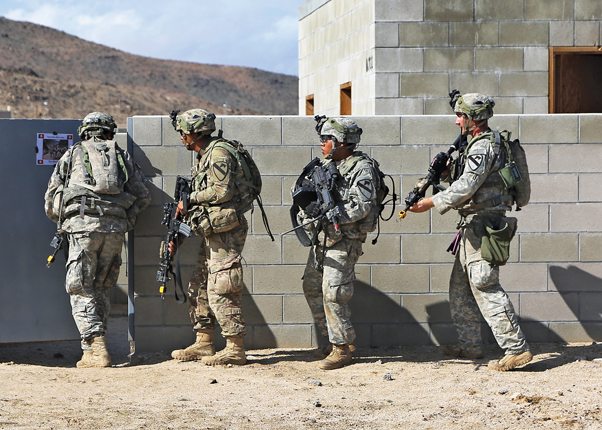 Bogart explained the NTC infrastructure – including an opposing force and austere environment – provides a realistic training environment that simulates what could be seen in a potential deployment, thus providing a tremendous training opportunity. Soldiers assigned to 2nd Battalion, 8th Infantry Regiment, 1st Armored Brigade Combat Team, 1st Cavalry Division, conduct security operations in the training city of Razish during a decisive action rotation here, Oct. 17.